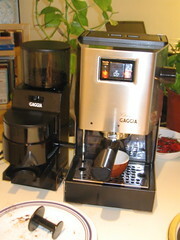 I got my Gaggia MDF grinder (left) last week to complement my Gaggia Classic espresso machine (right)-- it's wonderful! I got sick of buying beans pre-ground after getting good at pulling good shots, and now I can dial in my system-- a 22-25 second grind at setting 4 seems best for pulling a perfect 22 second double shot. So far, I've enjoyed Caffe Trieste's "Italian Dark Espresso" roast. After that was done, I filled it with 1/2 lb of 3-week old beans from Graffeo that were sealed in the fridge, and they were flat-- no complexity or richness, esp. since they ground 1/2 lb for me a few weeks ago and it was stellar-- I need to get fresh Graffeo beans. I got 1/2 lb from Caffe Roma to see how they roast, and while it's fresh, I'm not impressed.